It was around 8:30 pm Friday night. David Badar from Elad and his family were sitting around the table, in the middle of their Shabbat meal. When all of a sudden, the familiar buzz of David’s United Hatzalah radio alerted him to an emergency nearby. An infant was choking. The dedicated volunteer didn’t waste a second. He jumped up from the table, dashed out of his house, jumped on his ambucycle and flew along the roads to arrive at the address within 60 seconds. A young mother thrust her small newborn into the medic’s arms. The ten-day-old baby had asphyxiated on his mother’s milk; she was semi-conscious and her tiny body was entirely blue. The experienced medic immediately positioned the baby over his arm and administered chest thrusts and firm back blows. He cleared the baby’s airway and provided blow-by supplemental oxygen. Within seconds, he had stabilized the baby’s condition. As the newborn began to cry, David checked her over and then gently gave her back to her mother. The woman cuddled her baby close to her, overwhelmed with utter relief. David reassured her that the imminent danger was over, comforting both her and her stunned husband after the traumatic ordeal. Twenty minutes later, an intensive care ambulance arrived to transport the newborn to the hospital for observation and David returned home, filled with exhilaration, excitement, and joy. Re-joining his family at the Shabbat meal, his children asked him curiously what had happened. He was grateful to tell them that indeed, he had just saved a young life. 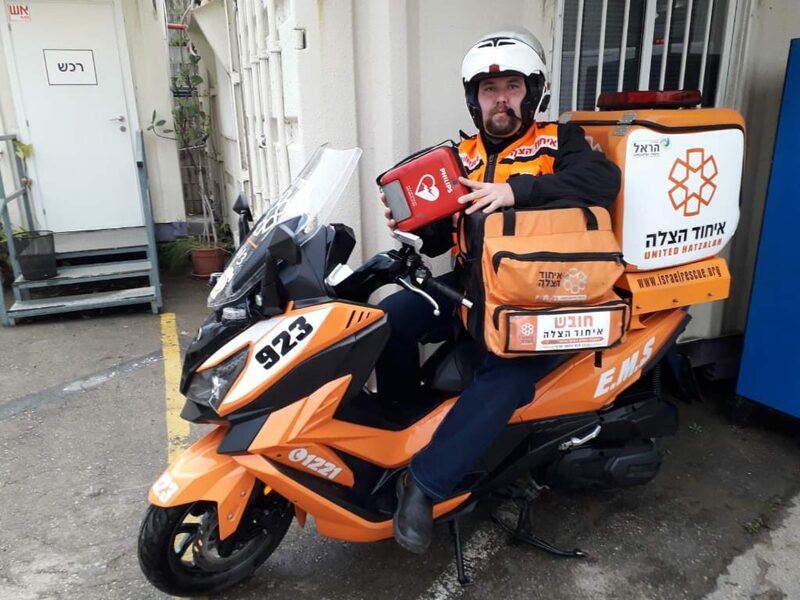 This entry was posted in Uncategorized and tagged Ambucycle, Bnei Brak, EMS, EMT, Israel, Shabbat Emergency, United Hatzalah. Bookmark the permalink.